What processes shape the Earth’s crust – the place on top of which we live all our lives? What really lies below our feet, deep underground? Can studying other bodies of the Solar System help us to better understand the geophysical processes taking place on our planet? In the Lithospheric Physics Department, we look for answers for these and many more questions. Our most notable achievements in the exploration of the Earth’s interior include the works of prof. dr hab. Marek Grad, which describe the shape of the interface between the Earth’s crust and mantle, known as the Moho. In collaboration with the Institute of Seismology at the University of Helsinki, we have carried out a series of deep seismic profiling experiments across Europe. In 2016, the data we collected have allowed us to present the first digital map of the Moho depth variations (https://www.igf.fuw.edu.pl/pl/cms/mapa-moho-02016-01-05/), covering the area of the whole European plate, from the Mid-Atlantic Ridge to the Ural Mountains and from the Mediterranean Sea to the Barents Sea and Spitsbergen. The Moho depth turned out to be 10–20 km under the Atlantic, 20–40 km on the majority of the continental Europe, and only locally as low as 40–60 km in the vicinity of Finland. Research concerning the properties of even deeper structures is conducted by dr hab. Leszek Czechowski’s group. 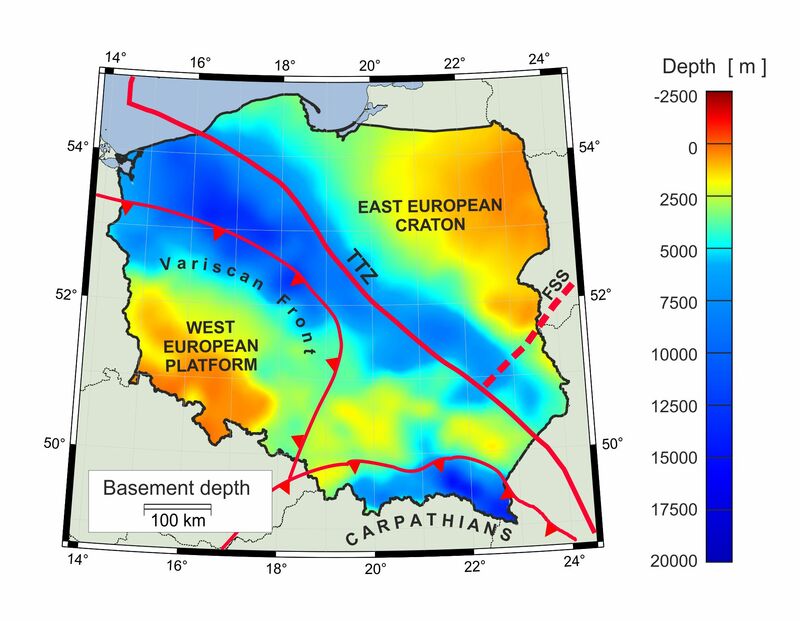 The team has been able to detect non-homogeneities in the heat flow at the interface between the lithosphere and the asthenosphere, at the depth of 90–100 km under the Niedźwiedź massif in the Lower Silesia. Studying the structures and processes occurring deep underground is an immensely difficult task. As a result, we resort to all available scientific methods: we observe the Earth’s gravitational and magnetic fields, and we measure heat fluxes from inside the Earth. Due to the physical limitations of collecting data about the conditions tens and hundreds of meters below the surface, numerical simulations play an essential role in our research. Our computer tools are specifically designed to recreate processes of a particular importance to our planet, such as convective movements in the Earth’s mantle. With some modifications, the same software can be used to model the phenomena occurring on comets, moons, and even different planets. To better understand the geophysical mechanisms taking place in the interior and on the surface of comets, dr hab. Kondrad Kossacki’s laboratory conducts experimental research on cometary ice analogs in conditions close to cosmic vacuum. Results of experiments in a suitably adapted vacuum chamber in conjunction with theoretical models and computer simulations have allowed us, among others, to learn more about the environment of the 67P/Churyumov/Gerasimenko comet, now widely known thanks to the spectacular European space mission Rosetta. Our research, however, is not limited to the smallest bodies of the Solar System. We employ numerical simulations to model the processes of condensation and sublimation of surface and ground ice on Mars, as well as its melting on the surface. For the ExoMars mission, currently under preparation by the European Space Agency, we learn about the details of methane transport in the Martian regolith. The significance of this work stems from the fact that, barring geological factors, the presence of methane on Mars would be one of the more important arguments for the existence of active life forms on this planet. The American Cassini mission to the Saturn system has provided us with especially interesting topics for research. We have explored such questions as heat transport under the surface of Enceladus, a small moon characterized by active tectonics, the presence of an underground ocean, and spectacular geysers which propel water matter into space. The research done by dr hab. Leszek Czechowski’s group has allowed us to explain why this moon still exhibits signs of activity, even though the similar-sized Mimas is tectonically dead. Based on the information about Enceladus, we have proposed an original hypothesis: not only does it seem to be the place where life could appear the earliest in the Solar System, it could potentially spread primitive life forms to other planets on tiny objects crossing the paths of the clouds of matter thrust by the geysers. Were this hypothesis ever to be proven true, we would all turn out to be… Enceladusians! No less interesting for us is Titan – the only body in the Solar System except Earth to possess open liquid reservoirs. Due to low temperature, high pressure, and the chemical composition of the atmosphere, the role played by water here on Earth is fulfilled by liquid hydrocarbons (methane and ethane) on Titan. Our research is focused on the hydrodynamic topic of modeling rivers which carve out the surface of Titan. We have been particularly interested in the mechanisms of suspension transport and sedimentation, as well as the formation of river deltas, especially in the context of analogous processes occurring in the rivers on our planet. Theoretical modeling and computer simulations have allowed our scientists, including prof. dr hab. Jacek Leliwa-Kopystyński, to propose an explanation of two intriguing features on another Saturn’s satellite, Iapetus – the origin of an enormous mountain ridge (as high as 20 km) stretching around the equator, and the moon’s significant flattening. The first structure seems to be the result of past convective flows, which would mean that the equator ridge of Iapetus was created similarly to mid-ocean ridges on Earth. As for Iapetus’s flattening, it may be a consequence of a high rigidity of its interior structure. It is probably so significant that it “conserved” the moon’s shape from an early phase of its evolution. Our portfolio also includes publications on such topics as Earth river evolution modeling, processes of impact crater formation on comets, or early thermal history of such bodies as Rhea (Saturn’s moon).